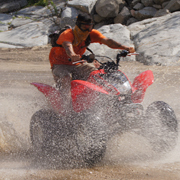 Head into the wilds of the Baja Peninsula on a thrilling All Terrain Vehicle (ATV) adventure. Drive your own personal four-wheeler for an adrenaline-pumping excursion to discover the wild country in and around Los Cabos. Baja has deservedly earned a worldwide reputation for a fantastic desert landscape ideal for off-roading adventures . Our expert guides will lead you to explore the natural environment that surrounds Cabo San Lucas. 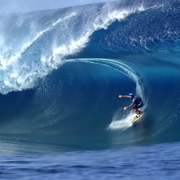 These tours offer vacationers the chance to escape from the usual tourist activities and ride through the rugged outback where you will discover sweeping canyons, rocky arroyos, the Sierra Laguna mountain range, cascading waterfalls pouring into fresh water pools, sandy hillsides, and a wide array of desert flora and fauna. That's the great thing about our ATV adventures; they combine the heart pumping action of off-roading with the serene appreciation for the natural wonders of this amazing habitat. In the desert landscape, you will see a variety of unusual plants including cactus. A wide variety of bird species (including migratory, tropical, and native bird) also inhabit this region. In addition to ATV tours to nature sanctuaries, mountains and deserts, we also offer excursions to the small villages and remote cultural hamlets that are the hidden treasures of the Baja Peninsula. 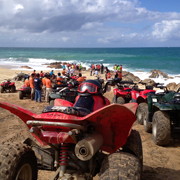 Our ATV tours do not all head inland; we also offer ATV expeditions along the coast of the Golden Corridor. Bring your whole family along; the kids will love the combination of motorized thrills with natural exploration that these tours offer. If you enjoy feeling the desert breeze on your face as the engine of your off-road vehicle roars between your legs, this exhilarating ATV adventure is the ideal way to explore the back country of the beautiful Baja Peninsula.